A total lunar eclipse will take place on 16 May 2022, the first of two total lunar eclipses in 2022, the second being on November 8. It will be completely visible over most of North and South America, seen rising over Northwest North America, and the Pacific Ocean, and setting over Africa, and Europe. Lunar Saros series 131, has 72 lunar eclipses. This eclipse series began in AD 1427 with a partial eclipse at the southern edge of the Earth's shadow when the Moon was close to its descending node. 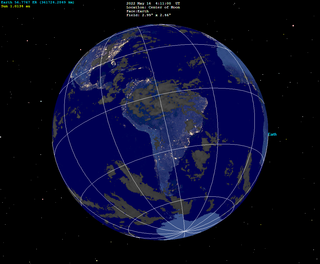 Each successive Saros cycle, the Moon's orbital path is shifted northward with respect to the Earth's shadow, with the first total eclipse occurring in 1950. For the following 252 years, total eclipses occur, with the central eclipse being predicted to occur in 2078. The first partial eclipse after this is predicted to occur in the year 2220, and the final partial eclipse of the series will occur in 2707. The total lifetime of the lunar Saros series 131 is 1280 years. Because of the ⅓ fraction of days in a Saros cycle, the visibility of each eclipse will differ for an observer at a given fixed locale. For the lunar Saros series 131, the first total eclipse of 1950 had its best visibility for viewers in Eastern Europe and the Middle East because mid-eclipse was at 20:44 UT. 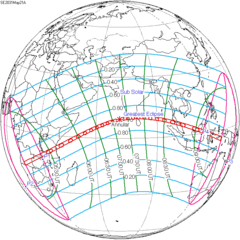 The following eclipse in the series occurred approximately 8 hours later in the day with mid-eclipse at 4:47 UT, and was best seen from North America and South America. 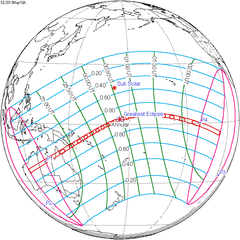 The third total eclipse occurred approximately 8 hours later in the day than the second eclipse with mid-eclipse at 12:43 UT, and had its best visibility for viewers in the Western Pacific, East Asia, Australia and New Zealand. This cycle of visibility repeats from the initiation to termination of the series, with minor variations. Lunar Saros series 131, repeating every 18 years and 11 days, has a total of 72 lunar eclipse events including 57 umbral lunar eclipses (42 partial lunar eclipses and 15 total lunar eclipses). The greatest eclipse of the series will occur on 2094 Jun 28, lasting 102 minutes. This is the first of the series that passes through the center of the Earth's shadow. The last occurrence was on May 2004 lunar eclipse. The next occurrence is May 2040 lunar eclipse. This eclipse is the third of four Metonic cycle lunar eclipses on the same date, 15–16 May, each separated by 19 years. The moon's path through the Earth's shadow near its descending node progresses southward through each sequential eclipse. The second and third are total eclipses. 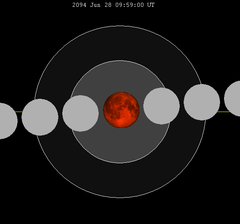 A lunar eclipse will be preceded and followed by solar eclipses by 9 years and 5.5 days (a half saros). This lunar eclipse is related to two annular solar eclipses of Solar Saros 138.